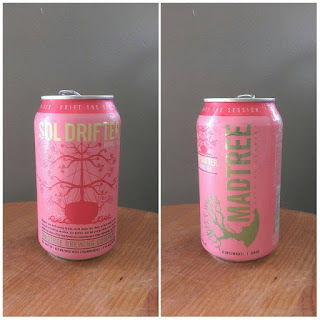 I'm excited for this post--I've wanted to write about MadTree for a long time. For the sake of airing my biases I'll say this now, at the start of the post: I love MadTree. In fact, I literally returned from their taproom less that twenty minutes ago. Why was I there? Well, they're doing a special release day for Shade, a gose inspired by a collab they did with Listermann Brewing Company (the place where I purchase my homebrew supplies). I'm not here to talk about Shade, though. I'm here to talk about MadTree Brewing Company's summer seasonal, Sol Drifter. First off, let me say this. MadTree is a huge community supporter. They have a page devoted to their various community partners throughout the Kennedy Heights/Pleasant Ridge/Cincinnati area. Their also pairing with a few local dog rescues to put on a psycHOPuppy event on August 17th (I'd totally go to it if I wasn't positive I'd be at work for the entirety of it's three-hour run time). I tell you this to show you that MadTree doesn't merely brew killer craft beers; they also mean a lot to the community in which they function, which is something I find admirable. What about the brew at hand? Well, according to the official page for Sol Drifter the beer is a 4.3% ABV blonde ale with lemon and lime hints from its hops and a strawberry finish. To keep in line with the honesty that began this post please allow me to be candid here: I've had Sol Drifter before. Twice, in fact. Once at the taproom and once when my roommate's friend brought some to our apartment. I have not, however, drank it like I would if I was reviewing it (although my first experience with it warranted a 3.5/5 on my Untappd). So, in essence, this will be a pretty fresh experience. What do I think about Sol Drifter? Starting with the aroma, it oozes summertimeness. Each waft of the ale brings lemon-lime notes to my nose. I find it to be rather enjoyable. 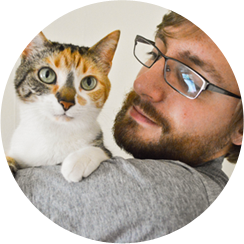 Purrl, on the other hand, hates it. She gave it three sniffs and was immediately over the brew. 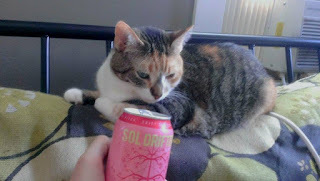 I'm pretty sure MadTree isn't trying to target cats so Purrl's opinion of the ale weighs less than mine. As far as the flavor is concerned, I get more hints of pine than I do lemon or lime. It's a pretty hoppy brew, which is fine by me because I've been making headway in learning to enjoy hops (seriously). And the strawberry? It's there, but it takes a little while to kick in. After you swallow, the flavor of it lingers in your mouth. More subdued than an aftertaste but very expertly crafted. Sol Drifter has a definite lightness to it. With a faint touch of carbonation, that's just bubbly enough to be noticed but not enough to make one belch, it's a very quaffable blonde ale. During the spring quarter of my sophomore year of college I'd spend Thursday afternoons by myself (I didn't have any class after 11 a.m. on Thursdays). I would typically head to the student union for lunch with my friends, buy a few cans of Arizona tea to stick in my backpack, eat lunch, and then head off with a book and my newly-purchased tea. My destination was always the same: a large rock on the trails behind the Ridges upon which I would sit for a period of a two to three hours while I read and drank the tea. Those afternoons, especially as the quarter drew on, were hot. I was usually a sweaty mess by the time I arrived at my destination. But there was often a nice breeze blowing through the area to cool me off. Sol Drifter reminds me of those Thursday rock-reading trips. 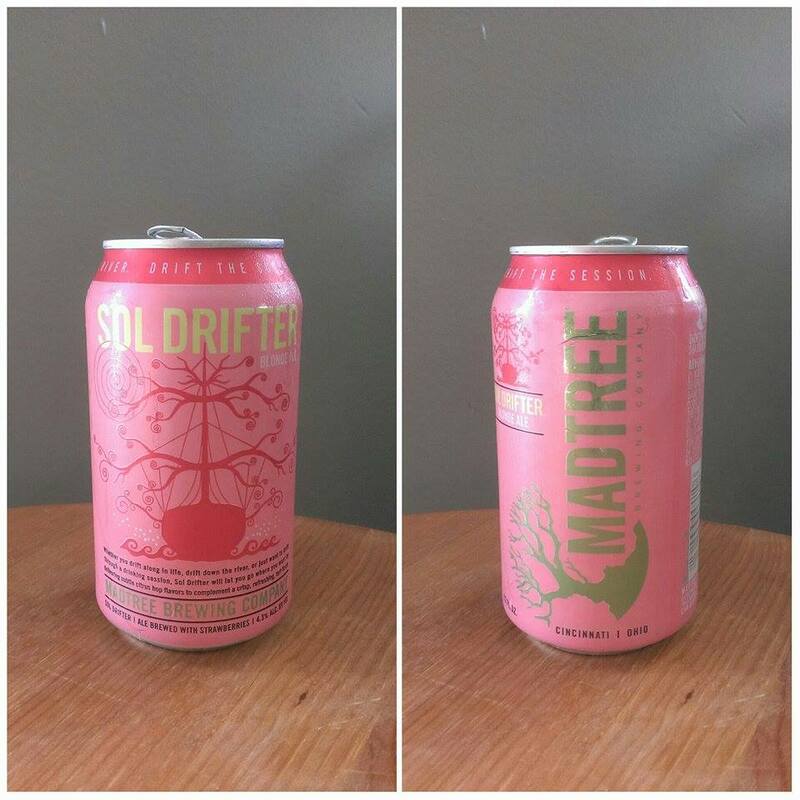 I originally give MadTree Brewing Company's Sol Drifter a 7.0/10. I'm recalling that review and am now giving it a 8.0. Maybe it's better from the can than it is on tap. Maybe I like hops more now than I did when I first had it (this is probably definitely the case). Whatever the reason is, Sol Drifter gets my recommendation. Try it out if you find it.